Yup, we’re starting with dessert, because we live in a free country, so we can. Brownies, cupcakes, ice cream, jello, pie… use your imagination. 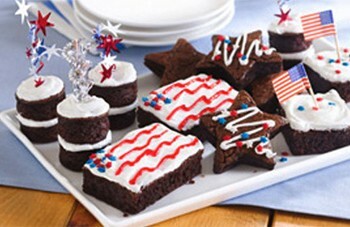 We can’t wait to try these Stars and Stripes Patriotic Brownie recipe, courtesy of Sprinkles & Grins. Because how could you possibly make chocolate brownies tastier? Marshmallow topping and frosting, of course! It’s the perfect time of year for a green salad full of garden-fresh veggies. And you can’t go wrong with potato salad or pasta salad. 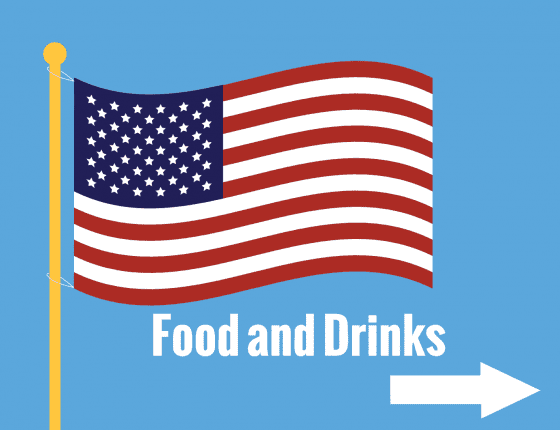 Just don’t forget to have plenty of ice on hand to keep everything cool—food poisoning is not patriotic. Get the grill out well in advance and get it ready. 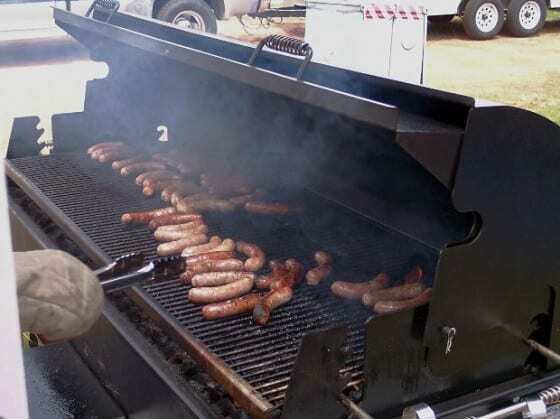 Scrub it up, make sure you have plenty of gas or charcoal and set up your grilling station with a table to hold food, a meat thermometer, and a few long-handled spatulas and tongs. Keep meat the right temperature, too. This chart from FoodSafety.gov will tell you exactly what temp everything should be for safety. Don’t forget to throw a few watermelons in a tub of cold water and ice. It’s the perfect, hand-held Fourth of July party treat… and you can have a watermelon seed-spitting contest, too. Lots of fruit is in season during July, so slice it, cube it or just leave it whole for guests to enjoy. 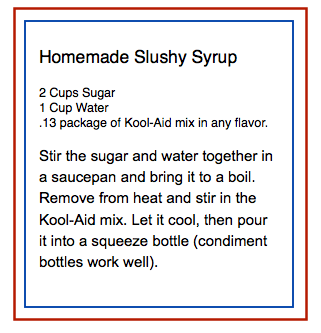 Ice-cold lemonade, punch and plenty of water are essential during triple-digit Fourth of July days. Keep everyone well-hydrated to avoid sunstroke. You can’t light those sparklers up until at least 9:00, when it starts to get dark. 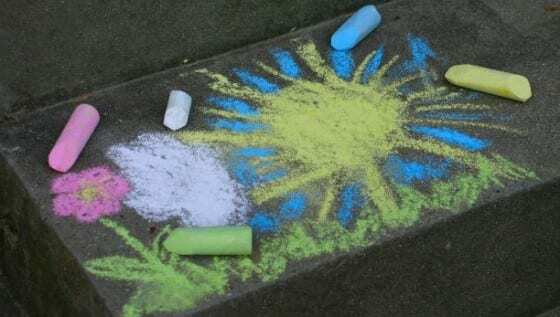 During those daylight hours, mitigate the whining and the “Puhleeze can we light the fireworks now?” with some great entertainment to keep the kids busy and distracted. You can get a lot of mileage with just $5 worth of sidewalk chalk. And, the kids’ creations adds to your party decor, too. 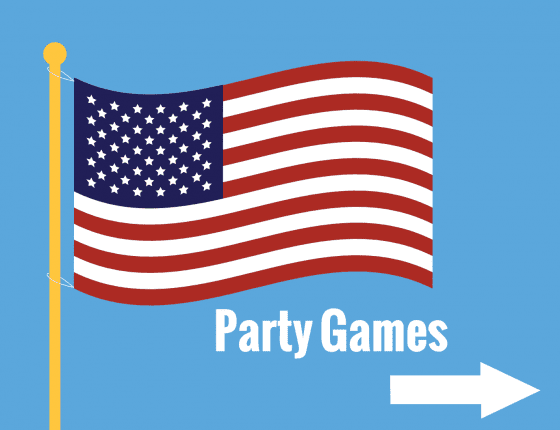 DLTK’s Crafts for Kids has a great Fourth of July Page full of printable games, puzzles and crafts for kids of all age. 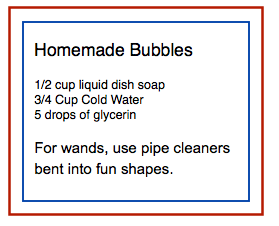 Make enough for the adults, too, because once you pull out the bubble wands, everyone starts feeling nostalgic. Soon you’ll see middle-aged men and elderly grandmas competing in do-or-die bubble contests. 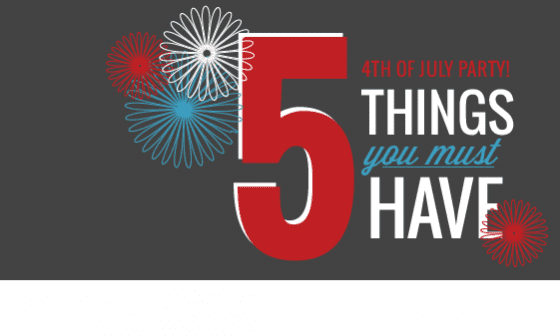 Last week we gave you 99 Spectacular Ideas for This Fourth of July. Check out the article for more fun ideas for kids (and adults). A few misters on the deck or patio can drop the temperature by several degrees, without getting everyone soaked. Pick up some inexpensive misters that attach to your garden hose at your local home improvement store for less than $30. Higher quality misting systems are offered at plumbing stores. They’re more expensive, but offer more even coverage and spray finer mist by using smaller nozzles that output higher pressure. If you’re the DIY type, you can make your own patio misting system. Here’s a great tutorial to show you how. 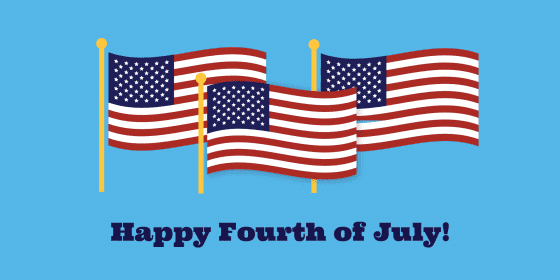 4th of July is a great day to drag out the hoses, kiddie pools and water balloons for some good, clean (and wet!) fun. Liquid Limbo: Use a hose turned on at full force to create a water “line” that people have to limbo under. Wet Sponge Dodge: Like dodge ball, but with water-soaked sponges—the large car-wash size. Or, use water balloons. Water Balloon Toss: Break everyone into teams of two or three. At one end of the yard, place a basket for each team; at the other, the starting line with baskets full of filled water balloons. Teams must run down the yard, tossing the balloon back and forth to each other, until they reach their basket. They place the balloon in the basket, then run back to the starting line for another. The team with the highest number of unbroken balloons wins. Make things more interesting by giving each team an “ambusher”—one guy with a high-powered water gun to shoot at and distract the opposing teams’ relay players. You can’t go wrong with some ice cubes, a blender (or two!) and some mixers. Mix up some margaritas and daiquiris. Provide plenty of fresh fruit and let people order their favorites. 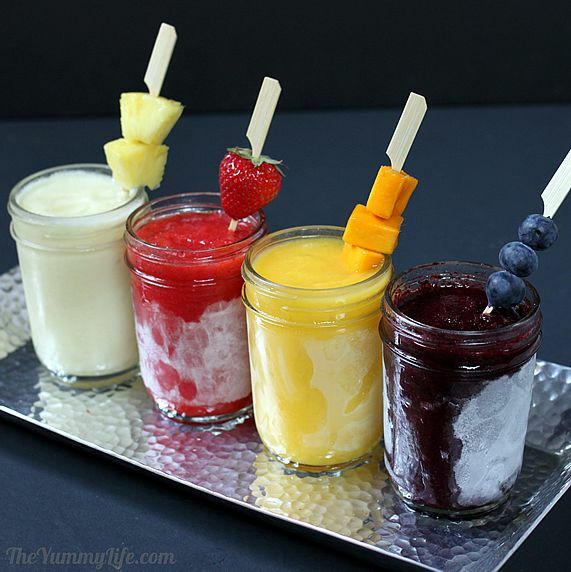 We love this make-ahead frozen fruit daiquiris recipe from The Yummy Life. Make ‘em non-alcoholic for everyone to enjoy. If you serve ‘em with the rum, remember to encourage responsible drinking and make sure that your guests are able to drive safely. Whether you just plug your iPod into some speakers, or have a live band, music is the ingredient needed to keep a party hopping. Since July Fourth is such a community-inspired holiday, ask around the neighborhood to see what musical talent exists. Is there a garage band who would like to play? A few high school musicians who play band or orchestra instruments? Do a little research and you’re sure to find some free (or really low cost) entertainment. If you have a bigger budget, hire a local professional band. If you have a really big budget, hire the Beach Boys. 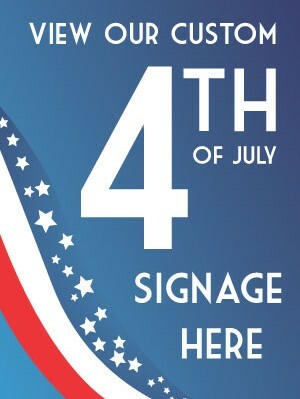 Check out the great Fourth of July templates at Signs.com! 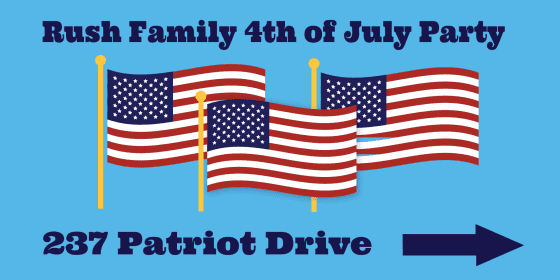 You can customize some patriotic yard signs, or a great July 4th banner.